I guess most disaster epics become at least a little melodramatic as their depicted crises unfold. 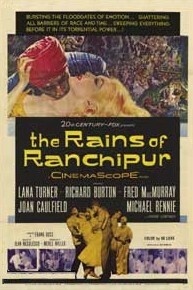 The interesting thing about The Rains of Ranchipur is that, despite the original theatrical trailers for this 1955 release, it isn’t a traditional disaster movie. In fact, the clear emphasis is on the melodrama. Twilight Time is certainly to be commended for helping rescue this Oscar-nominated, but largely forgotten, film from complete obscurity. As is customary for the boutique label, Ranchipur is available strictly as a limited edition Blu-ray (only 3,000 copies pressed) through Screen Archives. The incisively written screenplay (by Merle Miller, based on the novel The Rains Came, by Louis Bromfield) makes it very clear from the opening scene. The marriage of Lord and Lady Esketh (Michael Rennie and Lana Turner, respectively) is on the rocks. He (first name Albert) married her for money, she (first name Edwina) married him for status. But the two despise each other. They’re traveling to Ranchipur, a town in India, to possibly purchase a show horse. After that, divorce seems eminent, at least according to Lord Esketh. The Maharini (Eugenie Leontovich), the royal who oversees the town, had invited the Eskeths to Ranchipur. She’s winds up getting more than she bargained for when Edwina takes a liking to her personal physician, Dr. Rama Safti (Richard Burton). Yes, that’s two Caucasians filling shoes that should’ve been occupied by Indian actors. But that’s down to the era in which the film was produced. I don’t like it, but it is what it is. Anyway, Dr. Safti is the Maharini’s pride and joy. She doesn’t consider Edwina worthy of him. Frankly, the audience is likely to side with the Maharini on this one. Edwina is a cold, calculating wench (well played by Turner). Safti seems like an upstanding guy, resistant at first to Edwina’s advances. But like many guys, he eventually caves to her feminine charms. As interesting as all this is, Ranchipur is stolen outright by Fred MacMurray as Tom Ransome, a former acquaintance of Edwina’s. He was, in his day, an outstanding engineer. Now he’s an ambitionless alcoholic. 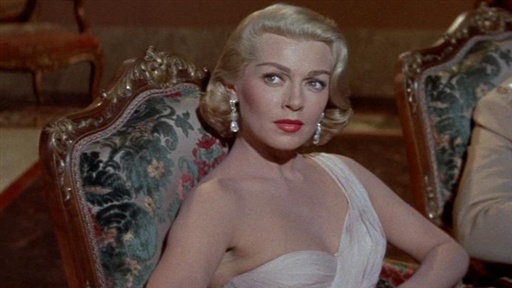 Sweet young Fern (Joan Caulfield) takes an interest (and a little pity, quite honestly) in Tom. She’s attempting to put herself through school and needs all the help she can get. In this pre-women’s lib era, her goals are frowned upon. Even Tom seems skeptical. Their friendship is a story thread that runs parallel, but largely separate from, the main one involving Edwina and Dr. Safti. But everyone is drawn together when natural disaster strikes. I’d almost say the earthquake and ensuing flooding of Ranchipur constitutes a spoiler, but the original film’s marketing campaign obviously wasn’t trying to hide it. The special effects earned an Academy Award nomination and they actually still impress to this day. Yes, we know much of the mayhem involves the use of miniatures, but we also always can tell when modern productions are utilizing CG effects. Sometimes the good old-fashioned practical props, etc. work better anyway. The disaster, which is followed by disease and misery, sort of represents the emotional troubles of the film’s characters. It’s just on a very grand, metaphorical scale. Revealing more about the actions of certain characters would, in fact, be spoiling things. Suffice it to say the aftermath plays out in a very interesting way. Twilight Time’s 1080p transfer is framed at 2.55:1 and looks very good throughout. There are occasional spots of very minor print damage here and there, but nothing that stands out too much. The vividness of the colors is exemplified by Turner’s rose red lipstick – if you’ve ever had a thing for the lovely Lana, the sight of those glossy lips in high definition will certainly leave you salivating. The image leaves very little to be desired. Milton R. Krasner’s Cinemascope cinematography is definitely done justice by this presentation. The real pleasant surprise with this Blu-ray comes in the form of audio. Films of this era often carry 1.0 or maybe 2.0 mono soundtracks – totally appropriate, since the majority of films were released that way back then. Ranchipur boasts an impressive 4.0 DTS-HD Master Audio mix that really springs to life during the disaster scenes late in the film. It sounds great the whole way through, but when the earthquake strikes and the dam breaks, this thing sounds practically like a modern movie. Extras are light, but Twilight Time’s standard music-only track is present. This allows us to hear Hugo Friedhofer’s lush, as times exotic, score isolated in 2.0 DTS-HD. Trailers and a vintage TV spot are offered up as well. Julie Kirgo contributes the informative liner notes essay.